This week the Daily Palette is celebrating Expressions of Home: The Watercolors of Lela Powers Briggs, an exhibition at the Cedar Rapids Museum of Art (CRMA). This show is on view through August 30, 2015. 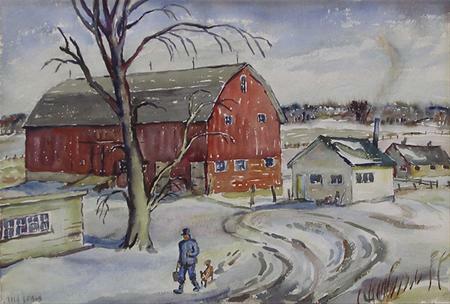 Coming Home, watercolor on paper, 15 1/2" x 22 1/2", n.d.
Lela Powers Briggs was born in Powersville, Iowa in 1896 and spent most of her childhood in Waterloo, Iowa. She studied at the Art Institute of Chicago and Iowa State Teacher's College (now the University of Northern Iowa), and pursued additional training at the Stone City Art Colony in Stone City, Iowa. Briggs became a successful professional artist: she created the covers and illustrations for the catalogs for her family's company, the Powers Manufacturing Company, she helped found the Waterloo Art Association, and she exhibited her work in solo and group exhibitions in the Midwest. "The career of Lela Powers Briggs exemplifies the life of many Iowa women artists of her generation. Largely self-taught, Briggs was a keen observer of the world around her and documented her life in a series of paintings and drawings of farm and domestic scenes, animals, historic buildings, landscapes, and portraits. Although her artistic compass was limited to Iowa and family vacation destinations, her work shows bold explorations of style unusual in the 1930s and 1940s."